The purpose of this research was to clarify the relationships between quadratus plantae (QP) and flexor digitorum longus (FDL) and flexor hallucis longus (FHL) using large-scale specimens. 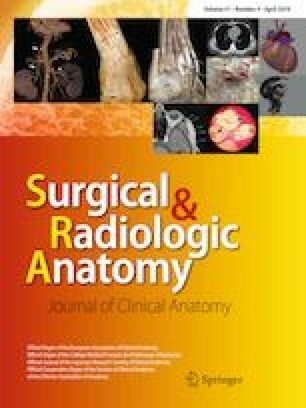 This study examined 116 legs from 62 Japanese cadavers. The QP was classified as: Type I, formed by the lateral and medial heads; Type II, the lateral head is absent; and Type III, the medial head is absent. The FHL branches to the lesser toes were classified as: Type A, connection from FHL to toe 2; Type B, connection from FHL to toes 2 and 3; Type C, connection from FHL to toes 2–4. Next, the relationships between QP and FHL and FDL were observed. Type I accounted for 87%, Type II for 10%, and Type III for 3%. Type A accounted for 33%, Type B for 53%, and Type C for 14%. Regarding the relationship between QP and FDL, regardless of the classification of the connections of the FHL tendon slip to the lesser toes, QP attachments to FDL branching to toes 2, 3, and 4 were seen in 47–59%. Furthermore, QP attachments to FDL branching to toes 2, 3, 4, and 5 were seen in 41–47%. QP appears to function strongly to counter the oblique pull of FDL and FHL and as a lesser digit plantar flexor. The authors would like to acknowledge and thank those anonymous individuals who generously donated their bodies so that this study could be performed. This study was supported by a Research Activity Young B Grant (17K13072) from the Japan Society for the Promotion of Science (JSPS) and a Grant-in-Aid program from Niigata University of Health and Welfare (H30B05). ME and TT contributed to study design and data collection, and drafted the manuscript; TI and TK contributed to data analysis and made critical revisions to the manuscript; WI, EN, RH, MI, and FK made critical revisions to the manuscript; IK supervised the study, contributed to analysis and interpretation of data, and made critical revisions to the manuscript. All authors read and approved the final manuscript prior to submission. The methods were carried out in accordance with the 1964 Declaration of Helsinki, and the cadavers were legally donated for the research by the Nippon Dental University of Life Dentistry at Niigata in Japan. Informed consent was obtained from the families of all subjects.